On the back side of a cardboard there is drawn a rabbit or a duck. Children will guess everytime what is in the drawing. A balloon passes through a tube and is prickled by 2 pencils. But Magic, the balloon doesn’t break! We pull out the pencils and the balloon has no hole. How to do a knot using just one hand? What colour is hidden in the box? A book with a straight key is signed by a person and holded in his hand. The magician succeed to bend the key in the book. 3 different coloured ribbons are hanged on a stick. With a magic those change the order on the stick. On the phone’s screen appear candies. Those are put on the hand and….they are real candies. A key is knotted on a rope and is given to a person. Magician succeeds to pull out the key from the rope. The audience will put in a bag various objects and those will become bigger or less or can be much more objects than at the beginning. A chosen card by a person is pulled out of Magician from the closed card packet which is in the pochet. The Magician holds an empty pot and the celebrated succeed to appear a flower. A drawn buterfly on a paper is introduced in a book but when the book is opened the butterfly flies. A child will cut a piece from balloon. After the celebrated says the magic formula the balloon will blow-up. A child introduces 5 coloured ribbons in a magic hat. After the celebrated says the magic formula the ribbons will be pulled out knotted from the hat. Now with Roumania’s flag too. Magician holds a rope and together with the children from the party will succeed to make the rope to stay straight on horizontal. Magician shows a book where the drawings disappeared. Children will succeed to appear the drawings and to colour them. A child choose a card from the card packet and this will appear on the phone’s screen. A person choose aleatory a card from the card packet and this one will appear in a mirror. Magician pours milk from a cup into a cornet and using a magic milk will disappear. Magician puts in a glass a scarf and transforms it in candies. 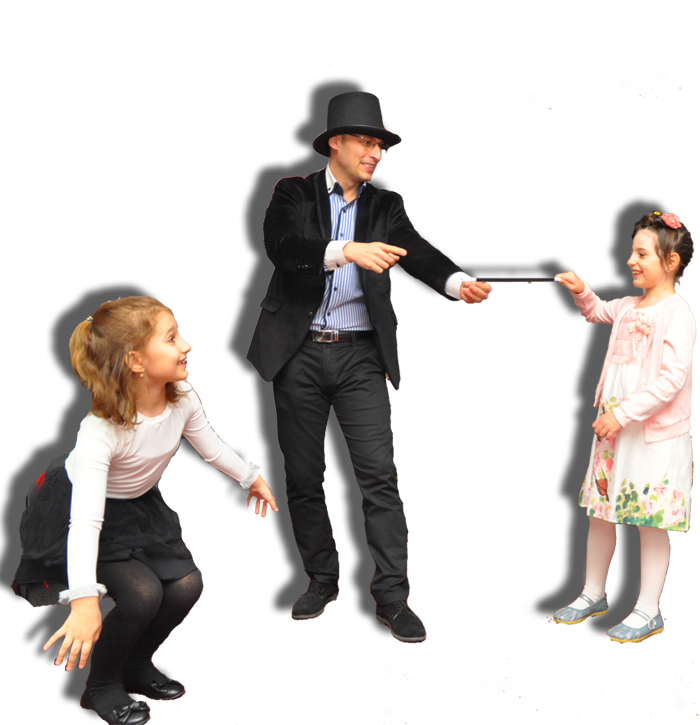 Together with a child or parent the Magician shows 3 cards. One of them has printed a bug. In a magic way the bug disappears from the card and appears…. Magician will fill 2 glasses of water (one for him and the other one for the celebrated). They will keep a glass on the head, will twist and will pour the glasses into their head. But…..surprise……..the water doesn’t run! Magician will break a tissue in front of the children and using a magic this one will be transformed in a new one after the magician used magic powder. Magician will hold a stick and by the help of children the stick will disappear. This trick will be done by the help of a child that will put a scarf in a glass and will fasten the glass. Using a magic the scarf will be pulled out from the glass. Helped by a child the Magician will make a „mistake” and will pour water in a hat, but using a magic he succeed to get out the water from it without being wet. Magician and a child will try to make a rope to stay straight in a glass. They don’t succeed but will realize something amazing. Pity is an imaginary character. 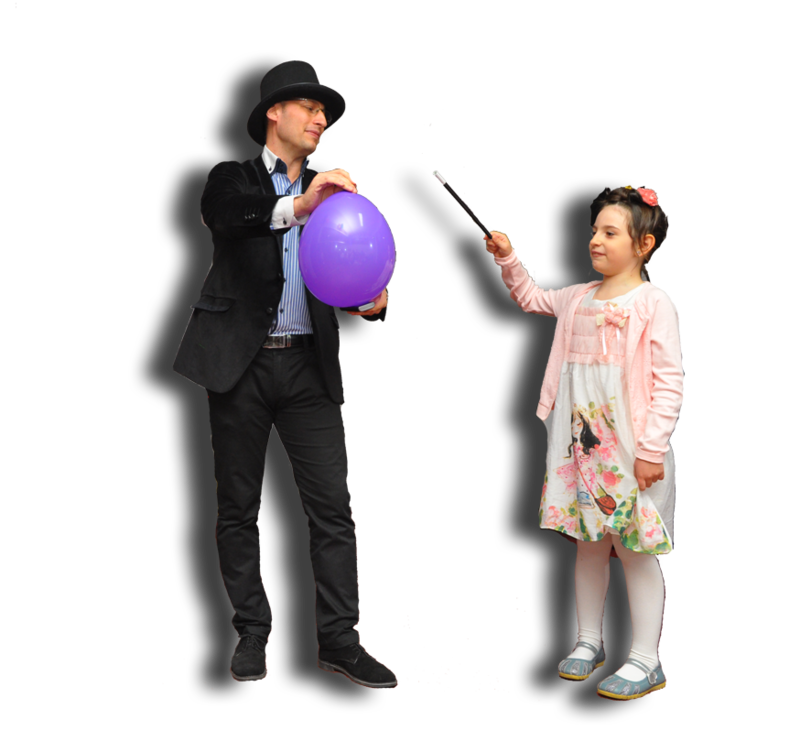 Magician will show to children an empty tube in which Pity will play with a ball and a rope.Even if the tube is empty inside of it will be happen magic things. A rope is passed through a straw. The straw is cut in 2 parts but the rope remains the same. Magician will make the objects around him to float. Using a magic 3 different ropes will become the same. A fascinating trick with 2 sticks where are hanged ribbons. Magician will fasten a rope around the hands of an assistant and the rope will pass through his hands and he will not feel anything. The celebrated, now magician’s assistant will succeed using a magic to pull out the knotted ring from the rope. A phone will be introduced in a balloon without breaking it. A funny trick in which a child will be dressed with the magician’s coat and fastened with 2 ropes. The others children will pass the ropes through the body and he will not feel anything . A magic wand that is moving itself in Magician’s hand. Magician will wrap a rope around his neck and will make the rope to split. Magician holds a handerchief in his hans. He moves it in the other empty hand and this disappears. Magician will be fastened on eyes and he will read the guests’s thoughts. The scarf can be tested. A famous trick in which the magician succeed to bend a teaspoon in front of the children. The celebrated will receive a magic wand from the Magician but in his hands this will break. A funny trick with sponge balls that appear and disappear from the children’s hands. Helped by the children the Magician succeeds to change the colour of 2 scarves. A pen will be introduced in a bottle and through a magic the pen will move and will raise inside the bottle. Magician and a child will have each a vase of flowers. They must turn upside down the vase of flowers without falling .Magician will succeed to do it but the guest will not do it and all the guest will be amused.